MADE RIGHT. MADE TO LAST. EZ-FLO® International manufactures and distributes premium quality appliance, plumbing, and MRO products that have been trusted by professionals and consumers for decades. Focused on innovation and quality, EZ-FLO provides the most reliable products in the industry. EZ-FLO creates private label programs for wholesale suppliers, appliance equipment manufacturers, retail buyers and buying groups that drive margin and market share. EZ-FLO owns and operates a state-of-the-art manufacturing facility, assuring the highest quality products available. EZ-FLO owns a national distribution network which operates five locations throughout North America. EZ-FLO & Eastman brand products have been synonymous with premium quality appliance and plumbing products for more than 50 years. For more than 50 years, EZ-FLO International manufactured products under the EZ-FLO & Eastman brand names. Over the years, the EZ-FLO Eastman product lines have expanded to include pans, outlet boxes, expansion tanks, and more. We operate ﬁve fully-stocked distribution centers totaling over 500,000 square feet of warehousing, strategically located in California, Texas, Florida, North Carolina and New Jersey. EZ-FLO Eastman products carry a long history of quality and innovation. Our products feature superior performance for a trusted and reliable installation every time. Customers are our number one priority. EZ-FLO International offers the best sales and customer service teams in the industry. We are ready to answer questions and process your orders quickly and accurately. With an ever-growing International presence, EZ-FLO is now distributing to over 15 countries including Canada, Mexico and the US in North America; Jamaica, Puerto Rico, Trinidad and the Dominican Republic in The Caribbean; Belize, Costa Rica, El Salvador, Guatemala and Honduras in Central America; Colombia, Chile and Peru in South America. EZ-FLO International’s core business remains the supply of our manufactured plumbing products to the strengthening economy in Mexico and the ever-present economies of Canada and the United States. Construction is on the rise in Central America and The Caribbean. EZ-FLO remains committed to supplying quality plumbing products at affordable prices to the region to support these efforts. With its countries seeing economic growth, South America is increasing demand for plumbing products that improve quality of life. EZ-FLO plays a critical role in the exporting of quality products. Our focus is on you, the customer, and our commitment is to bring the best value to help you grow your business. Our customer service team has a deep product knowledge and access to real-time inventory, shipping and inventory information. 1/4-Turn and Multi-Turn Stop Valves available offering superior strength, durability and overall performance. Full range of options include push-ﬁt connections. 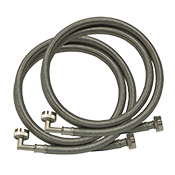 Our Steel-Flex™ water connectors work with all major appliances. All Eastman products feature superior performance for a reliable installation every time. 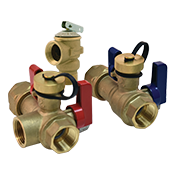 Constructed of heavy-duty brass this service valve kit makes flushing and servicing tankless water heaters fast and easy. Eastman outlet boxes’ one-piece construction provide a durable installation with easy valve access in five different connection types. 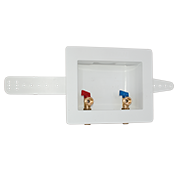 These boxes can be inverted for top-mount and center drain options are available. © 2018 - EZ-FLO International, Inc. - All RIghts Reserved.